Over the course of The Fresh Prince of Bel-Air’s six seasons, Jazz (DJ Jazzy Jeff, a.k.a. Jeffrey Townes) developed a very intimate relationship with the Banks family’s front lawn. Starting with the show’s second episode, when he was introduced as one of Will’s best friends, Jazz being thrown out became a crowd-pleasing recurring gag. If he showed up wearing his telltale brown-patterned shirt with two gold bars across it, there was a good chance he was getting chucked — the show reused the same clip (see above) of him flying out front door in that shirt 11 times. But the gag was nevertheless an especially memorable part of a classic show, and as the series went on, the writers offered up variations on the bit — sometimes Jazz would go out the back door (twice), or someone other than Phil would throw him out: Will did it three times, and Vivian and Geoffrey each did it once. 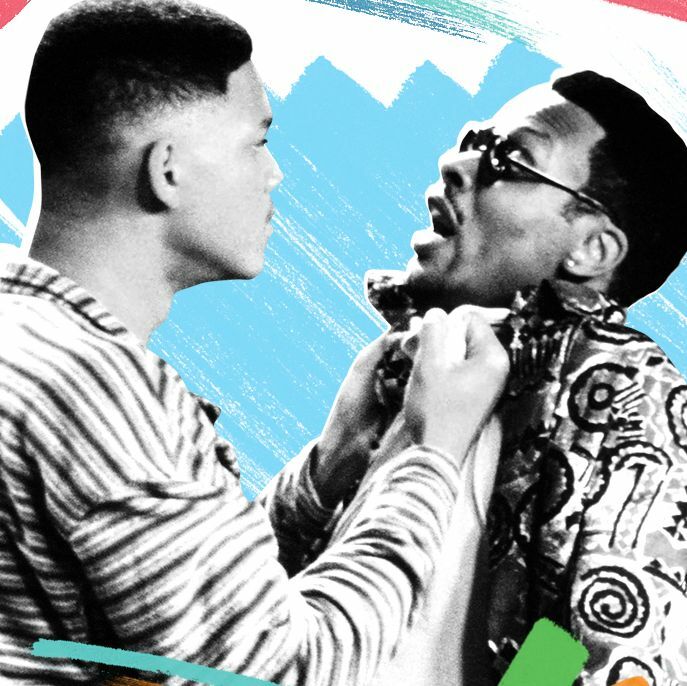 On the occasion of Fresh Prince’s elimination from our High-School-TV Showdown, we took a look back why and how Jazz was shown through the door those 15 times. Context: Phil and the family are enjoying teatime when Jazz stops by the first time. Phil asks someone to turn up the volume of his favorite record, Bach’s “Brandenburg Concerto,” and Jazz gets up to do it. Offending Action: Instead of raising the volume, Jazz starts scratching the record. Throw Fact: This was Jazz’s maiden voyage out the door. Context: Will and Jazz stay up late to watch TV one night. Uncle Phil starts heading downstairs, so Jazz quickly hides in the kitchen. Phil goes to the kitchen for a snack, and Jazz avoids him by walking right behind his back. As Phil leaves the kitchen, he says the house smells like cheap cologne and fried chicken. Offending Action: “I resent that,” says Jazz, thereby making his presence in the house known. Context: Will and Jazz reconcile after a falling out earlier in the episode. Offending Action: There isn’t really one. Jazz asks Will to throw him out of the house “for old time’s sake,” since earlier in the episode Will refused to do it because he said Jazz wasn’t even worth it. Aw, friendship. Context: Will and Vivian are talking about Will and Carlton moving out when Jazz shows up with a gift for Baby Nicky. Offending Action: Not only is the gift five months late, but it’s also clearly stolen, as it has someone else’s name on it. So Will throws Jazz out of the kitchen door. Context: Phil asks what kind of idiot would sell Will a car without insurance. Jazz, who had used his connection at Pep Boys to get Will almost everything in the car, takes offense. Offending Action: Jazz taunts Phil about not being able to throw him out since he’s already outside. Throw Fact: Phil throws him into the kitchen. It was the second time Jazz got thrown through a doorway in this episode. Context: While trying to fix some of the mansion’s problems, Phil accidentally disconnects the mansion’s phone line. Phil’s blunder inconveniences everyone, and they won’t let him hear the end of it. Offending Action: Jazz brings up the phone problem right after Phil demands that everyone stop talking about it. Context: Jazz and Tyriq, one of Will’s other friends, are bickering about who’s Will’s best friend, and Jazz boasts that he doesn’t even have to walk to his car when he leaves the mansion and offers a demonstration. Offending Action: “Yo, Mr. Banks, my tubby judicial brother,” Jazz says to have himself thrown out the house on purpose. Context: Jazz comes by the next morning with a 50th-birthday present for Phil. Offending Action: Jazz gives Philip his grandmother’s old false teeth for his birthday. Throw Fact: This was the last time Jazz was thrown out on the series. “Man, Uncle Phil, you beat your own record by like ten feet,” Will comments as they walk back to the kitchen. Context: After Will and Jazz return from the mall without any women, Hilary says it’s because Will was with Jazz, a.k.a. “Girl-Away,” and that Jazz would only be attractive in a blackout. Context: Will and Jazz come home and find Hilary reading a magazine in the living room. Jazz starts hitting on her, but she tells him to get out. Offending Action: Jazz says, “Your mouth is saying ‘get out,’ but your eyes are saying ‘get busy.’” Since Phil and Vivian (Janet Hubert-Whitten) are away, it is up to Geoffrey to throw him out this time. Context: Hilary returns to the mansion upset after humiliating herself on what she thought was a date but turned out not to be. Context: Phil interviews babysitter candidates to take care of his and Vivian’s newborn son, Nicholas, during Will and Carlton’s high-school graduation. Offending Action: Jazz interviews for the position, thinking it’s about taking care of Hilary. Context: Jazz sets Will up with his sister. The date goes badly because Jazz’s sister is really bossy. Offending Action: Jazz admits he only set Will up with her because her bossiness was getting on his nerves and he wanted to make her someone else’s problem. Throw Fact: This is the first time Will throws Jazz out of the house. Context: The Banks family is planning a surprise party for Will. Offending Action: Jazz informs Vivian that he booked a stripper for the party, which leads to her throwing him out the kitchen door herself. Context: The Banks family attends a séance, but Will’s skepticism causes the psychic to put a curse on the entire family that brings them all bad luck. Under the influence of the curse, Jazz and Hilary announce that they’re getting married. Offending Action: Philip tries to throw Jazz out after finding out about the marriage, but Jazz flips the tables on him and throws Phil out of his own mansion.